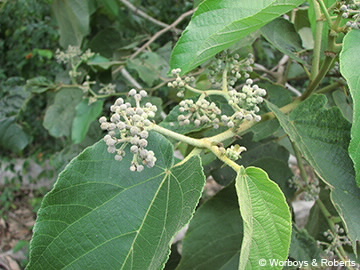 This tree has simple alternate leaves, stellate hairs are present on most parts. Inflorescence an axillary panicle, flowers 5-merous, petals mauve, prominent gland near the base. Fruit a 4-5- valved capsule to 8 mm long; seeds surrounded by white hairs.